At least 43 people have been killed and another 584 injured in a tsunami in Indonesia that may have been caused by a volcano known as the “child” of the legendary Krakatoa, officials said. Dozens of buildings were destroyed by the wave, which hit beaches in South Sumatra and the western tip of Java about 9.30pm local time on Saturday, national disaster agency spokesman Sutopo Purwo Nugroho said. 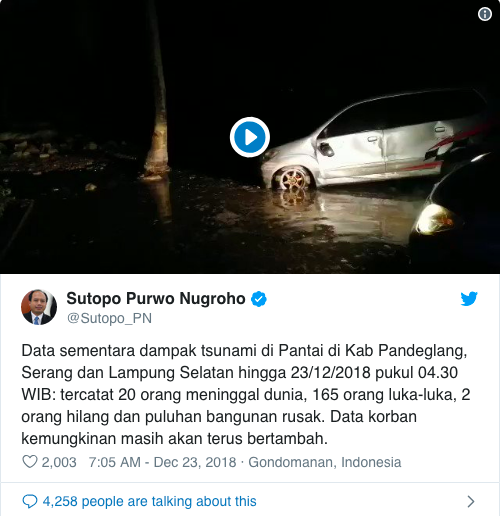 “We’re recapping reports of impacts from the tsunami that struck in the Sunda Strait, particularly Serang, Pandeglang and South Lampung,” Nugroho told Metro TV on Sunday morning, referring to the tidal wave linked to an earlier eruption of Anak Krakatau volcano. Hundreds of homes were damaged in the incident, Nugroho said. Footage posted on Twitter by Nugroho showed the aftermath of the tsunami, with flooded streets and an overturned car. Indonesia’s geological agency was investigating the cause, Nugroho said, adding the death toll would likely increase. Anak Krakatoa is a small volcanic island that emerged from the ocean half a century after Krakatoa’s deadly 1883 eruption. Indonesia, one of the most disaster-prone nations on earth, straddles the so-called Pacific ‘Ring of Fire’, where tectonic plates collide and a large portion of the world’s volcanic eruptions and earthquakes occur. The country regularly experiences deadly earthquakes, including most recently in the city of Palu on Sulawesi island where a quake and tsunami killed thousands of people.